Shopping is the most beloved activity of modern-day human being. Budapest, as every other big city, has shops of worldfamous brands to offer. These are to be found mainly in malls, Vörösmarty Square (Vörösmarty tér), Fashion Street and Andrássy Avenue (Andrássy út). But in order not to arrive home with worthless pieces of junk as a result of your frantic shopping spree, take a little time to look through our selection of shops. The most sensitive issue is, of course, that of the souvenirs. These are the items traditional tourist hubs are flooded with. Fortunately, there’s another option. If you want a classic Hungarian product, purchase ground paprika at the Great Market Hall (Központi Vásárcsarnok), Rubik’s cube at any of the souvenir shops or Hungarian porcelain of worldwide fame in Andrássy Avenue (Andrássy út). The world of fashion and commercialization has bombarded the capital with a silent invasion. Each week, coming soon signs are appearing on storefront windows, promising yet other items of globalized fashion, but you can rest assured they are not for the average Hungarian. From famous designer labels like Louis Vuitton and Chanel, brand-name items, stylish secondhand shops, and, sad to say, As Seen on TV stores, Budapest offers a far wider array of shopping experiences than just a few years ago. Should you want an entertaining „Hungaricum”, your best choice is Rubik’s cube. A popular yet overpriced shopping area for travelers is the Castle District in Buda, with its abundance of folk-art boutiques and art galleries. A healthy education about Hungarian wines from historical local viticulture regions can be found in the intimate labyrinthine cellar of the House of Hungarian Wines, but buy elsewhere for a better price. Most supermarkets carry an extensive selection of Hungarian wines. 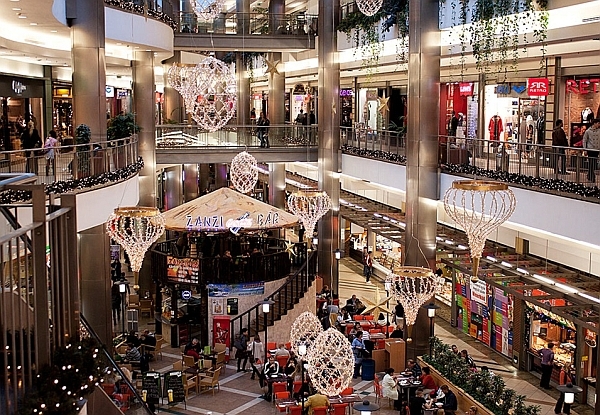 Hungarians tend to do their serious shopping on Pest’s Outer Ring (Nagykörút), which extends into West End City Center, a shopping mall, located just behind the Nyugati Railway Station. Another favorite shopping street is Pest’s busy Kossuth Lajos utca, off the Erzsébet Bridge, and its continuation, Rákóczi út. Andrássy út, from Deák tér to Oktogon, is popular for browsing or wishing, since it is the more upscale shopping street. It is out of question that the most popular shopping/pedestrian walking street of Budapest is Váci utca. Together with the adjacent Liszt Ferenc tér and Nagymező utca, Andrássy út is a popular hub for nightlife, with numerous coffee shops, bars, and restaurants (many change often). Nestled among the plethora of cafes and restaurants on the lively Ráday utca, you will often find small boutiques and shops where you can find unique presents and doodads. You can often pay by credit card in the most popular shopping areas. Most stores are open Monday to Friday from 10am to 6pm and Saturday from 9 or 10am to 1pm or sometimes 2pm. Some stores stay open an hour or two later on Thursday or Friday. Sunday, most shops are closed, except for those on Váci utca. Shopping malls are open on weekends, sometimes as late as 7pm. Refunds on the 27% value-added tax (VAT), which is built into all prices, are available for most consumer goods purchases of more than 45,000 Ft ($173/EUR 143) purchased in one store, in 1 day (look for stores with the taxfree logo in the window). The refund process, however, is elaborate and confusing. In most shops, the salesperson can provide you with the necessary documents: the store receipt, a separate receipt indicating the VAT amount on your purchase, the VAT reclaims form, and the mailing envelope. The salesperson should also be able to help you fill out the paperwork. Use a separate claim form for each applicable purchase. If you are departing Hungary by plane, you can collect your refund at the IBUSZ Agency at Ferihegy Airport. You have to do this right after checking in but before you pass security control. Otherwise, hold on to the full packet until you leave Hungary and get your forms certified by Customs when you land. Then, mail in your envelope and wait forever for your refund. Two wrinkles: You must get your forms certified by Customs within 90 days of the purchase showing that it is leaving the country, and you must mail in your forms within 183 days of the date of export certification on the refund claim form. We have never found this to be any significant savings since there is a “service charge” for the service. Unless you are making grandiose purchases, you may want to save your time and energy for other things. For further information, contact Global Refund (Innova-Invest Pénzügyi Rt. ), Budapest, IV. Ferenciek tere 10. (00 36 1 411-0157; fax : 00 36 1 411-0159; www.globalrefund.com). You can ship a box to yourself from any post office, but the rules on packing boxes are as strict as they are arcane. The Hungarian postal authorities prefer that you use one of their official shipping boxes, for sale at all post offices. They’re quite flimsy, however, and have been known to break open in transit. The Hungarian post does not have a five-star rating on service, but they do rank four stars with misappropriating packages coming and going from the country. Very few shops will organize shipping for you. Exceptions to this rule include most Herend and Zsolnay porcelain shops, Ajka crystal shops, and certain art galleries, which employ the services of a packing-and-shipping company, Touristpost. Touristpost offers three kinds of delivery: express, air mail, and surface. The service is not available directly to the public, but functions only through participating contracted shops. You need to consider whether the cost of shipping will still save you money by purchasing your fine porcelain and crystal in Hungary than at home. Hungarian Customs regulations do not limit the export of noncommercial quantities of most goods, except collectibles. However, the export of some perishable food is regulated, but allowed if acceptable to the receiving country. The limit on wine and spirits is not limited at export if shipped, but may be limited by Customs at your destination. Shipping wine can be prohibitively expensive.